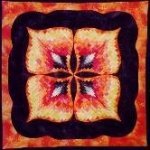 Fruit Cocktail, a 28"x28" wall hanging, will test your bargello piecing skills! You'll learn how to piece 3/4" strips accurately using freezer paper (not included) as you master Jennifer Amor's unique "Floating Foundation Bargello" technique. You'll love the way your finished wall hanging appears to "float" colors, giving it a 3-dimensional effect. Limited supply of GridGrip available for purchase at $ 12.50 for package of 5 sheets plus 1pound shipping charge.